Home StyleBespoke	bespoke & co.
2017 consumers are unaccustomed to the concept of entirely custom, made-to-order clothing and accessories. A century ago, it was common to have garments made (or make them yourself) instead of shopping for what already existed, but we live in a different world. Bespoke & Co., located in South Tampa, brings a rarified experience out of Savile Row or Via Montenapoleone to our backyard—many don’t realize how relevant it is. Having lived in Italy and experienced the bespoke process with three dress shirts from Eligo (formerly SATOR), I was thrilled to learn that Bespoke & Co. is legit, using Ermenegildo Zegna, Vitale Barberis, Loro Piana, Charvet, and Turnbull & Asser fabrics, and production sites personally vetted by owner David Kahn in the USA, Italy, China, and Hong Kong. Bespoke is a term that reflects the most customized, most involved creation of unique garments for an individual client. Many fashion brands like Prada and Ralph Lauren offer “made-to-measure” services, but this is a step down in complexity. Base sizing is still used to construct the piece, and then a tailor will adjust it to fit properly. Nevertheless, some nuances of the body cannot be accommodated in the way they can with true bespoke, and while fit can be modified, design often cannot. For the majority of suit-wearers, off the rack is the only affordable option. Both men and women’s garments benefit from good tailoring, but many miss this step in getting “as close to perfect” as they can for something they wear regularly, are photographed in, and have often paid for dearly. What I’m saying is, if you can afford it, bespoke is the way to go. David and his team have made adjustments to their supply chain (like production sites in Asia and a range of fabric prices) so that they can offer the most important element of their process—that is, hand measurement and advice on fabric choices and cuts—to clients who aren’t millionaires. I visited the Bespoke & Co. showroom one Friday morning to learn more about what makes the brand unique. David’s journey took him through specialty retailers like Mitchell’s of Westport (CT) and volume operators like Nordstrom. The opening of Hugo Boss at International Plaza brought him to Tampa, where he settled and founded his own brand to serve discerning local lawyers, media figures, professional athletes, and anyone desiring something beyond the scope of limited local shopping. The most valuable element of Bespoke & Co. (and bespoke in general) is the thoughtful, collaborative, “partner” approach. Like designing a new home, it requires consideration of how a client lives and works, his or her personal fit preferences, and the pieces that are necessities vs. non-essentials. For me, a set of custom shirts was more critical than a suit. I like to pair them with denim or casual pants, untucked. I never embraced business-formal dress, i.e. traditional suiting, because of its price, the traditional color and fabric choices, and awkwardness in fitting my body type, which is curvy in certain places, and I like a fitted feel. I always felt lost among the options. I also prefer saturated earthy tones of blue, gray, tan, and green, and modern silhouettes, rather than preppier, fuller looks in pastels and prints. In essence, the standard for menswear brands and tailors in the South. Thanks to his good taste and background across brands and aesthetics, and the extensive catalog of fabric options available at Bespoke & Co., David is equipped to meet any client desire—from wedding formal to everyday casual—and mimic designs seen on menswear runways, street style blogs, or magazines ads. The added benefit of a custom, flattering fit more than justifies the cost. Wardrobe consultative services like Bespoke & Co. may not be within reach for everyone, but the option is something to keep in mind as your income grows and you invest in clothing that you plan to wear for a long time, as your body slows its rate of change, and your taste becomes more focused. 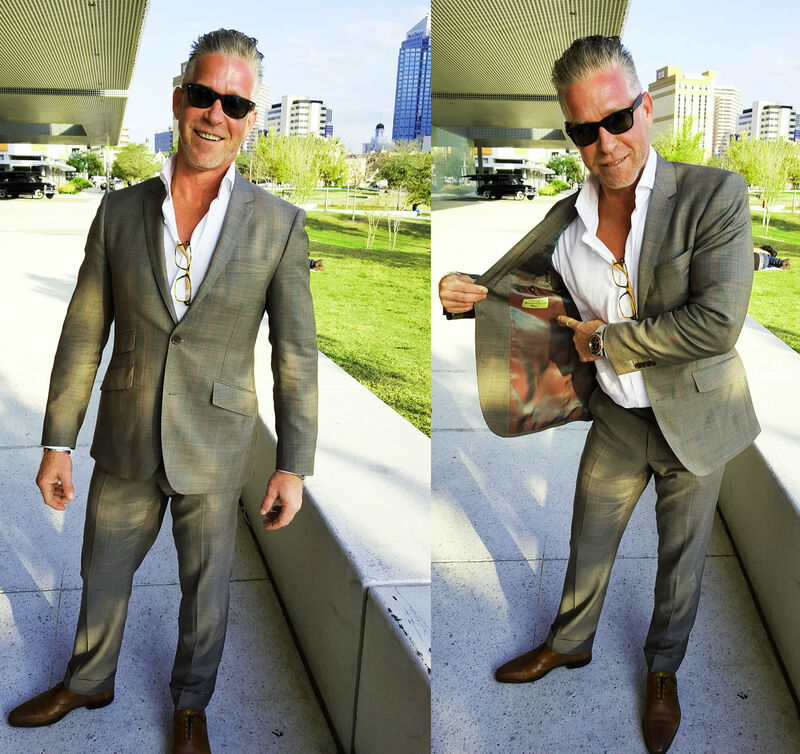 We’re lucky to have someone like David in the Tampa community, an entrepreneur, passionate about his craft, adding dimension to our dressing and style. He is in good company with other taste-makers like Sasha Fruitticher at LondonPhilips, Rob Akins at Uncommon Finds, Cassie and Jake Greatens at CASS, Tona Bell at The Paper Seahorse, Brent Kraus at Ella Bing, Roberto Torres at The Blind Tiger, and Jess English at the Oxford Exchange. They are all, in their own ways, changing the of Tampa, and it makes me very happy. Visit the Bespoke & Co. showroom, located at 3305 West Bay to Bay Boulevard, by appointment.